I love the color white in the summer. It is so cool and refreshing. This notion must be spilling over to my taste in watch and its color. 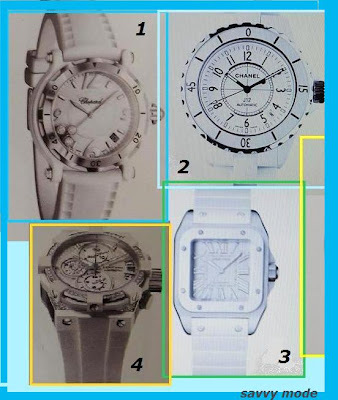 I am drawn toward cool white sporty watches this summer. There is something so savvy and unique about a white luxury watch against a tan wrist, showing off a gal's athletic side. My favorite is no. 1, Chopard Happy Diamond Sport. It's simple, classic, sporty and has diamonds. I would have picked Cartier Santos but have one already so will not consider another in a different color. Which is your favorite watch personally? hello.. thank you so much for a lovely tip on the luxurious bath. I shall certainly upgrade my simple milk+water to a higher level. I really like the Concord-just my styling!! i love all chanel watches! number 2. is my fav...but all are far too expensive! Oooh, I adore these. Very cool looking. I suppose my favorite watch is my newest one, that teal monstrosity that dominates my wrist on occasion! I love number 4! Any watch with lots of technical looking gadgets gets me every time. I have a watch that allows for interchangeable straps, and I got a white one for this summer. I love it. Oh I totally love chunky watches, and the Chanel J12 is so hot!! i love the chanel j12! I'm a big fan of white too...but lots of colorful accents! Hmm...I'm digging the square one...kind of different! white is fantastic for summer!!! too bad my wrist is just way too small for watches..